Capterra, an online service that connects buyers and sellers of business software, wrapped up Project Management Election 2012 today. 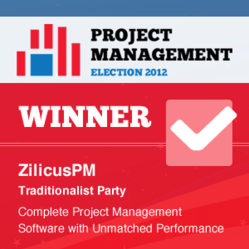 The election pitted top project management software products against one another in an election-themed competition. After a month of campaigning and a very tight race, ZilicusPM rose to the top. Project managers, users, fans, and employees cast more than 30,000 votes throughout the election, and it all came down to ZilicusPM and Easy Projects in the final round of voting. ZillicusPM ended with 52% of the votes, and they were excited to be named Project Management President. “We have been experiencing tremendous growth. As we continue to align our innovative approach to meet customer expectations, we are ready to take ZilicusPM to the next level where it will be the most preferred choice for both traditionalists as well as contemporaries. We will remain committed to our customers and continue to offer the best product in the cloud based solution category,” said Dhan Wagholikar, Co-founder of Zilicus. The election began with 55 nominated solutions divided into two parties: The Traditionalists and The Contemporaries. Traditionalists work best with a traditional, phase-based methodology. Contemporaries generally work best with an Agile or customizable approach. ZilicusPM ran on the Traditionalist party ticket and caters to traditional project management practices. The industry has seen a shift in recent years toward Agile methodologies, but based on this election it looks like many project managers still favor a traditional approach. For a full list of software options, check out Capterra's Project Management Directory. At Capterra, we believe software makes the world a better place. That's why we love connecting buyers and sellers of business software. Our website shows companies all of their options and provides free tools to help them make the right decision. We provide software companies with a free listing on our comprehensive directory and give them the opportunity to upgrade for more exposure. Capterra helps more than 5 million people annually find the right software for their business. More than 15,000 software companies are listed in Capterra's comprehensive directory. For more information, visit http://www.capterra.com.